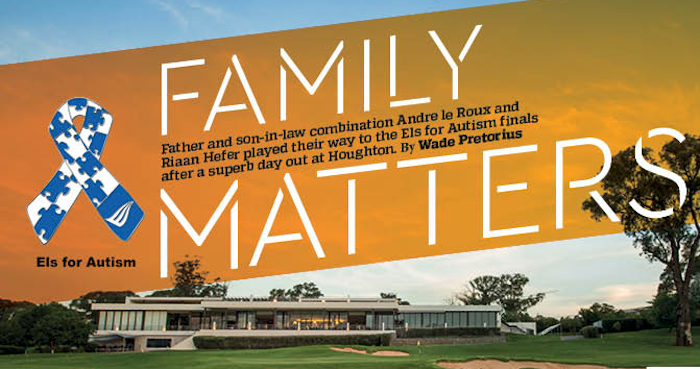 Father and son-in-law combination Andre le Roux and Riaan Hefer played their way to the Els for Autism finals after a superb day out at Houghton, writes WADE PRETORIUS. As the Drive to Sun City moves into fifth gear, it was Andre le Roux and Riaan Hefer (right) who kept calm and collected their ticket to the main event after accumulating 47 points. But this wasn’t a case of beginner’s luck as the duo have been regular supporters of the golf day for a number of years and have not been shy of stating their goals. ‘Of course we went out there to win,’ Le Roux, who plays off a nine, tells Compleat Golfer. ‘We have a good thing going and combine nicely.’ Ask who the captain of the ship is and you’ll get two answers. ‘I think he is,’ says Hefer. ‘No, we both play our own game and any decisions we make are made together,’ says Le Roux diplomatically. Both are on the same page, though, when it comes to why this is an event not to be missed. Hefer has already signed the pair up for further days in this series as they look to ‘check out’ the competition. Le Roux admits the prospect of winning the final and teeing it up at the Nedbank Golf Challenge Pro-Am is enough to send him to the range more regularly. ‘The nerves will be there for sure. I guess a little more practice won’t hurt the cause,’ he adds. Hefer, who gets three more shots a round on his father-in-law, concludes by saying that maybe he too will be working on his game, with the Lost City’s reputation preceding it.